I’ve been having pain in my big toe, which originally started after having some inner ankle pain. Hoping this stretch will help, thanks! It does sound like the FHL. Give it a few days of consistent stretching to adapt and I think you’ll notice some positive changes! Good luck! Sorry for long post. Two yrs ago my left big toe start hurting after going for a run. Gradually my Achilles and the inside of my ankle joint started hurting. After a week of hobbling around and getting worse, I could barely walk and went to doc. Torn Achilles and tight outer calf was diagnosis. Rehabbed for months. Never 100% but I can play sports again but rotating my ankle out hurts. Now my right toe is hurting and I can feel my ankle/Achilles following. Do you think this is problem you described? Thank you for your question. It does sound like the FHL is involved in this ongoing injury you described. After an extended period of time of moving around in pain you probably flared up some secondary problems. Like I said, doctors are quick to jump to the Achilles as the problem. If you’ve been rehabbing for months and it’s still not 100%, then I’d say the diagnosis may not be completely accurate. Try doing the FHL stretch for a few weeks and if your symptoms start resolving then you should be all set. The pain with rotating your ankle out might be related to a joint in your ankle which is an example of a secondary problem. That might go away with the other issues, but if not, it would be worth your time to visit a sports focused PT to have them assess your ankle range of motion. Good luck! When you describe your pain as now being in the big toe, ball of your foot, and arch, you’re describing a significant portion of path of the FHL as described in the post. My guess is that the pain you felt in the back of your calf 8 months ago, which was diagnosed as “Achilles tendonitis” was not actually an Achilles problem. The boot has limited your ankle movement and taken the strain off the FHL tendon where it runs behind your Achilles but has made the strain apparent further down into your foot (if you limit one part of your foot, another part will try to make up for it). I expect that if you consistently do the FHL phonebook stretch daily as described in the post, you should notice some positive changes within a few days. Thanks for your question and good luck! I have a terrible pain that comes on when I am pushing on gas pedal with my right foot. The pain runs shoots horrible into the inside of my big toe and back. If I take my foot off and step flat, it seems to stop and as soon as I put it on the pedal again, I am grinding my teeth the pain is so bad. I have no clue what is causing this. The problem you’re describing sounds like a nerve impingement issue. You would definitely benefit from seeing a physical therapist to identify where the impingement is coming from. It’s usually simple fix once the source has been found. In the mean time, try experimenting with different knee and hip positions (moving your seat forward or back) while you’re in the car to see if you can press the gas without the intense pain. Good luck! I’ve had a nagging, achy pain in and around the ball of my foot, mostly at the base of the big toe for about 8 months now. I’ve been looking around the internet, seeing physical therapists, sports doctors, and massage therapists but none of them seem to really have a sure idea of what’s actually causing it. After reading your article it seems to be a problem with the FHL. The pain started at the heel and moved to the ball of the big toe, after I switched to barefoot running shoes and also doing a lot of calf focused workouts. The inside of my heel is also extremely tender to the touch, though it doesn’t hurt to walk. I’ve also noticed my left lower leg (which is side the pain is on) can’t bend forward as far as the right when my forefoot and heel are planted on the ground. Does this sound like an FHL problem? If so, would the FHL be too tight and be in need of stretching/lengthening? Would love to hear your thoughts. Hi Austin, Definitely an FHL problem. All of your described sites of pain are along the path of the FHL. The lack of range of motion of your left lower leg is probably ankle stiffness which would add to the strain put on the FHL. Doing the FHL stretch described in the post should provide relief within a few days if you’re consistent with it. You would also benefit from general calf stretching, foam rolling your calf and massage. Lastly, if you can find a PT who will do a technique called a joint mobilization to your ankles, I think you notice significant improvement in a very short amount of time. Thanks for your response! I’ve been doing the FHL stretch posted here and I have found that when I do it I only really feel it around the ankle, and not all the way up FHL muscle beside the shin. Also I’ve been looking for and working on trigger point areas in my lower leg and it seems that it’s the deep calf muscles that are really quite tight/tender (i.e. FHL, Tib. Posterior, FDL, Fib. Brevis). The more external muscles (soleus, gastroc.) seem to be fine so it’s difficult to actually get a good calf stretch. I’ll keep working on the FHL stretch and talk to my PT about joint mobilization. I’ve been really massaging the tender areas of the inner muscles and I was wondering how often I can do that? They feel more tight immediately after and then slowly get better, though I’ve only done it twice. Hi, I had an injury following an accident where a moving metal object hit the outside of my right ankle. It was in between the ankle bone and the Achilles. My foot got dragged and wedged underneath and I was left with a haematoma and lots of swelling for weeks. I had an MRI scan which showed a small effusion in the ankle joint and a rectro calcaneal bursa and the doctor then queried Achilles tendernitis. It’s now 7months on and I tried to return to work. My job is very active and strenuous at times. While I was carrying something down the stairs I felt an ache in my ankle but just thought it was because I hadn’t been working on it. Later I got shooting pains and and increase in the ache and swelling which reduced with ice therapy. The pain has now subsided but It returns when raising up on the ball of that foot as far as I can go. The pain is in my Achilles area but not painful to touch. I also find I get it if I crouch down. I do not have any pain in my big toe so was unsure if this definitely ruled out FHL. I have had some physio and have now been discharged so haven’t discussed this pain with the physio. Could this be FHL? Is there any exercises or advice you can give me please? Also it’s been 7 months is it likely to get better or something I will just have to live with? Hi Laura, This injury is quite different from an overuse injury. We have many small bones & joints in our ankles & feet and based on the description of your injury, I would suspect that one or more of those joints has been damaged and/or slightly displaced. This would cause your foot to have a movement imbalance and would explain the excessive amount of time that the pain has been present. I think it would be worth going back to see your physio to have them re-examine the function of your entire foot and ankle complex. There is a technique called joint mobilization that they may be able to do which might help restore the proper function of your ankle. If you had no soft tissue tearing in this injury, you should be able to recover 100%. I hope that helps. Si glad I found this post!!! I’ve been dealing with “achilles tendinosis” for 6 months now… The pain in the achilles tendón área comes and goes… Some weeks I can run almost no pain and then some weeks I can barely walk after a period of inactivity. Several doctors diagnosed me with achilles tendinosis or tendonitis and when they presicribed rest the pain was even worse. I have very limited ROM on my big toe and I really have a hard time extending it. I will work on this stretch and hope this will help! Thanks again for this post!!! This article was linked to on /r/running on reddit, and I decided to try out the stretches. I’ve been doing tons of toe-lifts for weeks and my “achilles pain” was not getting any better, and kept spreading to the bottom of my foot. The only thing that helped was loosening my laces, and that was only temporary. Long story short, 3 days of doing the phone book big-toe stretch and I just got back from a 4 mi run with NO PAIN OR BURNING. It felt amazing. Thank you so much! Thank you very much for your feed back! I’m always happy to hear when a person gets back to running without pain. Especially when a simple stretch helps fix those annoying problems. Thanks again! I’ve been having issues with my left achilles/FHL for a few months now. When I originally felt the pain, I was sure it was achilles tendinitis. There was creaking ,pain when I tried to run, and my leg was tight each morning. With that, I took a few months off and did eccentric heel drops. Now, the only time I feel pain is when I do FHL stretches (by putting big toe on a wall and leaning forward with my knee) or when I get on my toes. However, I’ve been doing that stretch for a few weeks and haven’t really felt any change for the better. The same stretch does not hurt when I do it with my right leg. Do you have any thoughts? 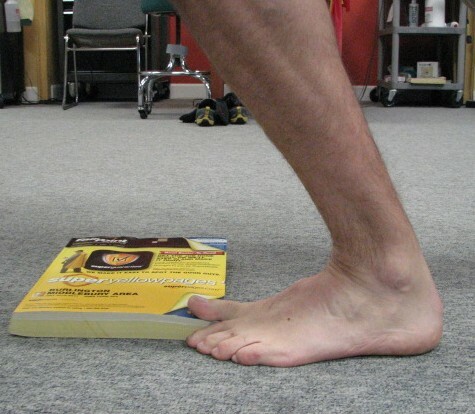 Hi Brandon, Take a look at the picture in the post of the FHL stretch on a phonebook and try using that same set up with the four smaller toes (all at the same time). I have found that when the FHL doesn’t seem to be responding, the flexor digitorium longs (FDL) may be the problem. If that doesn’t do the trick, you should be evaluated by a PT because there is something else going on. Good luck! Thanks. I just went through 6 months of rehab for “achilles tendonopathy” with no results when a MRI confirmed the pain to be an FHL issue. Are there any strengthening exercises that should accompany this stretch? Use of NSAIDs indicated? Hi Adam, An irritated FHL is typically due to over use of the muscle by “gripping” with your toes when you’re running or walking. This is why flip-flop or thong type shoes are not good to wear for prolonged periods, because a person has to grip with their toes slightly to hold the shoes on. In addition to the FHL stretch, I usually have people work on strengthening their feet & toes in the opposite direction; which is lifting your feet & toes up in the air. This is easily done by leaning against a wall then raise and lower your forefoot and toes up and down as many times as you can. You’ll feel the muscles in your shin become fatigued. Another activity is practicing walking while holding your toes up and pushing off the ball of your foot vs your toes. This helps retrain your brain to not use the toes as aggressively. It takes time but I’ve seen it work many many times in my patients that come to see me. As far as NSAIDs, I always suggest that if you can sleep without pain, try to avoid NSAIDs because taking pain medicine might cover the pain and make the injury worse. Pain is our body telling us that something is wrong. Thanks for your questions! Again, thanks for the article. I’m still wondering if it pertains to me…. So over a year ago I was walking up stairs and a large “pop” happened in the back of my left foot. Since then, I’ve had sharp pain and swelling in between my ankle bone and achilles tendon. I first thought it was my achilles, but X-rays ruled that out. I’ve been to a rheumatologist and several foot/ankle specialists. I’ve had several X-rays, two MRIs, 6 months of physical therapy, and I still haven’t found or determined what the problem is and how to fix it. The pain and swelling occurs after I’m standing or walking for more than 10 minutes. Running and working out is so hard to do, but I push through the pain. By the end of the day, getting off the couch to go to the bathroom I have to limp there it hurts so bad. I’m so frustrated with it, and I have tried pretty much everything. Also, I am applying for several jobs that require a physical test, so I want this fixed, like yesterday! Please help! Hello Samantha, It definitely sounds like this is an FHL problem, especially since you had all the imaging and specialists to rule out other problems. You said you’ve been to PT, but I suspect they did not focus on the exact problem. Try doing the “big toe” stretch described in the post and also try doing the same stretch with your other toes on the book. The FHL is usually the main problem but its neighbor (the FDL which moves the other four toes) can also cause the same symptoms. It sounds like your situation has become chronic so it might take a couple weeks of consistent effort before you notice improvement. Also keep in mind that you might feel like the stretches are making things worse for the first few days. Stay consistent and things should start to feel better within a week or two. I’ve been having pain/discomfort in the FHL region for over a year. My MRI results showed FHL tendon issues and I have done a walking boot, stretching, and EPAT for 5 sessions. Even after my 5th session (one week ago), I’m still feeling some discomfort in my calf when I curl my toes and when I stand on my toes in the area right above my heel. Any thoughts? Hi Brandon, Thanks for your question. I have a couple suggestions for you. First in regards to stretching: I always encourage my patients to do the stretching at least 2-3 times a day making sure you hold the stretch for 30 seconds 3 times each side (yes, even the unaffected side). Anything less than this and you may not be affecting the muscle/tendon enough for it to heal properly. Second, you can try placing your toe up on something higher to get a more complete stretch. Third, make sure you hold the stretch so your hips are over and slightly in front of your foot. Some people keep their hips back too far and don’t feel like the stretch is affective. Another consideration is that the walking boot may be actually contributing to the problem. A boot minimizes the amount the muscles in your foot have to move and can cause them to remain tight. Think of it in terms of a bicep injury where the bicep needs to be stretched, which is done by straightening your elbow. If you then put your arm in a sling the muscle is shortened and just tightens back up from disuse and never achieves its full range of motion. 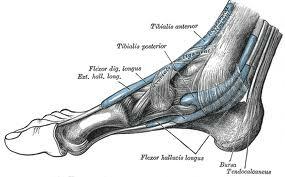 Finally, there is another muscle in the calf that goes out to the other four toes. It’s called the flexor digitorium longus (FDL) . I have been seeing more instances where this muscle & tendon unit are also irritated and contributing to the problem. You would stretch this muscle the same way as the FHL stretch. The only difference is you place all your toes (don’t worry about the little toe, it rarely cooperates) on the object to do the stretch. Look critically at your stretching routing and see if any of these options can be helpful. Good luck! I have 0 pain or soreness. When i point my toes I notice pain and stiffness and my big toe seems to not be able to move as well as the other while pointed. I also cant point at the same depth as the other. About a half inch off. It was worse but the laser treatments etc. Are working. Its been about 4 weeks now and I could light jog with minimal pain. But the pain radiates through the left and right side and heel of my ankle. Very odd. Never had this before. I just want to get better so I can train again…… I hope this is not career ending or anything. I wanted to give track and field at least 4 more years before I hang up the spikes. Im 31. Great Post!!! Hi, I’m glad you found the post helpful! Thank you very much for the feedback. Your description definitely sounds like it’s an FHL issue. I think doing the stretch described in the post will help you get past this injury more quickly. You can also do the same stretch with the other 4 toes propped up on something to include another muscle that works closely with the FHL. You may notice the pain moving around to different spots in your ankle & foot over time. This is actually a good sign that the muscles & tendons are responding. You should notice improvement within the week but it will take a few weeks before the pain is completely gone. Good luck! The back of my ankle and lower calf hurts when I try to walk to move my foot around. I can point my toes up or down with almost no pain. The pain occurs when I try to walk to move my foot. Yes, there is more force on the foot & tendons when you’re weight bearing. I expect the stretching will help. You can also add the small toes to the stretch and get another muscle involved which may help more. First, thanks for writing this all out for us! The anatomy lesson really helped to identify where I believe my issues are coming from. My Story: I fell while climbing and unfortunately extremely hyper-dorsiflexed my left foot when it impacted the wall. X-rays showed no fracture and good alignment—luckily, could’ve been SOOO much worse. Its been almost 3 weeks since the injury and I’m walking pretty well. I can bear full body weight on the heel and the ball of my foot, (some pain in the arch) but when I try and lift up or weight my toes at all theres Alot of pain. Curling my toes can also produce focused pain in that calf region also. My lower inner leg/calf was very bruised and I’m thinking its gotta be from trauma on the FDL and FHL. I can move all my toes normally, so the muscle/tendons couldn’t have ruptured completely, right? Anyway, thanks for the insights and I hope in time things will improve. I’ll be adding these stretches to my routine! Hi Karl, Your description does sound like a partial, although severe tear to your FHL and/or FDL. I hope you’ve had much progress in the past few weeks and are continuing to make progress! Thanks for your feedback. I’m happy to hear that you found the post helpful! I am a ballet dancer and my physio told me that the reason my inner ankle is hurting is due to my FHL. The pain was all of a sudden, I literally stood up from warming up before a ballet class. The pain was so severe I was struggling to walk. The pain soon lessened, but was still pretty bad! As soon as this injury occurred, I have had the problem where my big toe can’t fully touch the floor (demonstrated in the first lot of pics). The pain started around September last year, and is still the same to this day! The pain occurs when I am halfway through a rise and also sometimes hurts en pointe (on my toes in pointe shoes) I have had lots of rest (during holiday breaks) and it hasn’t helped it at all! Please help me with ways to treat it! I will try out the toe stretches and see if they help! My Physio suggested rises but they hurt a lot! She also said it is secondary to growth. Do you agree? Hi Ella, This injury sounds to be likely more than a muscle or tendon strain. It is definitely not just secondary to growth. 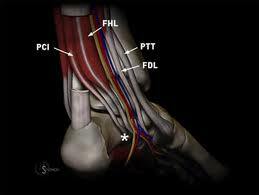 The sudden onset of intense pain is common with a severe tear of the FHL or FDL tendon based on your description. For you to still have the same level of pain many months reinforces that idea. If you have not had much progress since trying the toe stretches you should seriously consider having an MRI done to see the extent of the damage. Once that is done you should be able to come up with a solid plan of recovery from a local physio. Thank you for your question and best of luck to you! My question is: I am a vegan, not a healthy one…per say…i don’t take vitamins, i don’t take supplemental protein supplements and i don’t eat 6 meals a day and hardly drink enough water….about 3 days ago, i decided to change that…slowly but surely…i started by going to the gym and eating more raw fruits and veggies ….and adding protein supplements (plant) …when i started going to the gym 3 days ago i decided to take it slow and start to build up my stamina….since i haven’t been to the gym in ages…first day i did some deep stretches (pushed as far as i could go) for about 10 minutes and then got on the treadmill for 45 mins (mix of brisk walking, running….stretched after ….second day …did the same thing except did a bit more running this time….3rd day i was able to stay on the treadmill for a good hour, even added some incline so i could push myself even harder….by the fourth day i noticed i was sore but not unbearable…i went to the gym, stretched as usual ….i noticed something odd though…while i was stretching i noticed that i was able to stretch alot further on the left leg than the right,,,,almost as if the leg had no feeling….when i was done stretching and went to get up i could hardly walk without limping….my left leg had completely died on me ….as i paid more attention to the numbing feeling i realized i could move my leg just fine but it was from my ankle down (feet and toes) that could not move properly…i can point my toes outwards but i cannot bend them back towards me….it was pretty embarassing because i stumbled a few times on the treadmill cuz my foot just gave out on me….the whole time i had to look down at my feet so i wouldn’t trip over them…the fastest that i could push myself was 2.5 speed 2.0 incline….and i had gotten up to 5 speed 5 incline at the highest within the last 3 days of starting back the gym. i don’t know if to just relax and let my pain gradually go away and let my body heal itself, if to go to a doc and get it checked out (no insurance yet) OR if I should continue going to the gym and walk it out ( the pain i mean) 🙂 please help…i am limping right now ….i rested yesterday and today but plan on going back tomorrow. Hi Krystal, Typically any time a person has sudden onset of numbness and lack of mobility, this is a problem. Definitely something you should go see a doctor for. I also suggest you seek guidance from a personal trainer to help you progress your fitness safely. It sounds like you may have done too much too soon. Best of luck to you! Hey! Really hoping you can help. I have been training for a marathon since late Dec. It’s an 18 week plan and my marathon is now in 4 weeks time. Last week, mid way through a faster session my lower, inside calf started to ache. Then a few miles on it really, acutely hurt. I couldn’t even jog back to the car 400 metres away. The next morning I was carefully getting out of bed as I was expecting to be in pain but nothing. Great, I thought. Slept it off! But as I walked down the stairs, I felt the pain again – it’s sort of just to the left of centre, above my ankle and doesn’t feel like the Achille’s. I rested it for a few days and it felt fine to walk on. I could even jump, hop etc. But after 10 metres of running it started hurting again! So I rested for a few more days then went for a 3-4 mile walk (I even carried my daughter on my shoulders for a while). Didn’t feel a thing, no sense of injury at all. Tried to do a little jog later on and it hurt again. So it’s definitely a muscle or ligament involved specifically in running rather than just walking? But really doesn’t feel like my Achille’s. If I feel the indent under my inner ankle bone and follow that indent up the lower part of my calf – that’s where the pain comes. Hi Rob, This sounds like a very frustrating situation. It’s definitely a running specific problem, but one that would take a page to describe in writing the biomechanics involved. However, because it has not progressed to the point of being a problem while walking, it might respond quickly. If you start by sitting on the floor and setting your calves on a foam roller and roll your mid to upper calves inward & outward (think of your feet moving like the wipers of a car), you’ll likely feel a very uncomfortable muscle knot (or two) in your calf. This tightness is the source of your pain. Spend ~5 minutes working on that spot and around it, rolling back and forth over it. It might even start to feel less painful as you spend more time on it. After rolling your calves, do the toe stretch described in the blog post but include all your toes on the book- I have found that the handle of a small dumbbell works even better and is less uncomfortable than a book. I hope to update the blog post with this bit for information in the not too distant future. It’s very important to hold the stretch for 30 seconds and do 3 rounds on each side, yes even the asymptomatic side, 2-3 times a day. The 3rd round should feel significantly better. I have had many patients do this regimen and make significant progress. I hope this helps you as well. Please keep in mind that 3x a day is good, 10x a day is not better. Good luck and I hope you make it to the start line and finish line of your marathon!